Where have central Canada’s missing Monarch butterflies gone? The group wants to grow more food to help the monarch butterfly population. 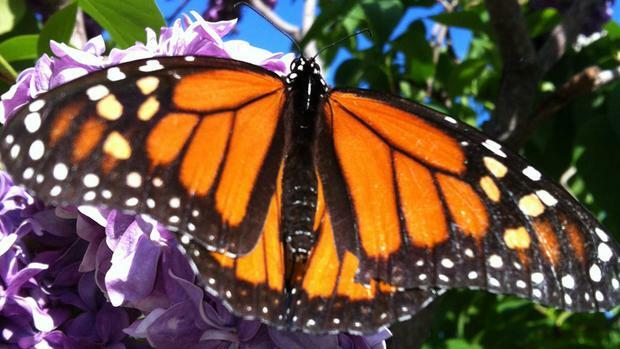 The arrival of monarch butterflies is a traditional sign of early summer in parts of central Canada, but this year, the orange and black royalty seem to have stood us up. First the bees and now this — what's happening to our insect friends? Well, in the case of the bees, the jury is still out, but the butterflies — with their well-documented migratory paths — are easier to figure out. The remarkable monarchs migrate more than 4,000 kilometres each year. Those that live east of the Rocky Mountains flying from their warm overwintering sites in central Mexico's oyamel fir trees to regions like southern Ontario, usually arriving at their summer home in late June or early July. Those that live in and west of the Rockies instead migrate between British Columbia and California (and with no dire words about them, supposedly they are doing better than their eastern cousins). Why bother going through such a long journey? Because their larval food of choice — the milkweed — doesn't grow where they spend the winter, and up here where the milkweed grows, it gets too cold in the winter for the butterflies to survive. So what's up this year? While we may have a lot of milkweed available up here already, the monarchs haven't been so lucky south of the border, and it's really what goes on in the U.S. Corn Belt that determines their progress. "Loss of habitat is the major reason monarchs are declining," said Chip Taylor, the founder and director of Monarch Watch, according to CBC News. "People have to remember this is a continental species and what happens locally is only a small part of the story." "Just because there is a lot of milkweed in some areas of Ontario does not mean this applies everywhere," he added. "The northeast has been relatively untouched by changes in agriculture and there is still lots of milkweed, but it's not a big monarch production area. It's what happens in the corn belt that determines the size of the monarch population and milkweeds have crashed in this area." Also according to CBC News, Elizabeth Howard of Journey North, a monarch research group, reported that a cold spring in Texas this year had taken a toll on the milkweed there — the plants hadn't grown enough for the monarchs to make use of by their usual arrival date. Monarch Watch reported in May that the size of the overwintering population of the flock was the smallest recorded to date, meaning there were fewer of the insects than usual to make the trek north. Habitat loss, pressure from human activities like pesticide spraying, and changes in the climate are, apparently, all suspects in the decline in population. Last year, by Victoria Day, adult monarchs were being reported in droves up as far as Timmins and out to Halifax. This year, the furthest north they'd been reported by that time was only the Toronto area. As tracking continued through June, the butterflies were reported in small numbers up to Saskatchewan and out to Maine, although many people used to being swarmed by monarchs by this time of the year are still waiting to see even one. So we know the butterflies are out there, at least, and there's ways that we help them along! For one thing, anyone who sees them — both monarchs and milkweed — can report the sighting to Journey North, as they keep track of the migration's progress. Those who feel a little more 'hands-on' can get involved directly by making a 'monarch waystation' near their home by planting milkweed, since monarchs don't lay eggs on anything else (because that's all the larvae eat). Adult monarchs, on the other hand, enjoy a liquid diet of many different kinds of nectar and juice from fruits, so planting fruit trees and flowers will help, and they're a good way to make your yard look better too. Now, if you really want to be the monarchs' favorite house, you can even buy special butterfly feeders that take a kind of sugar water (a bit like humming bird feeders), and put out a sand-filled butterfly bath, and even leave out pieces of fresh fruit — bananas and watermelons are favorites — although that last one may attract other insects as well. Since they're all under the environmental gun these days, you can be a hero for butterflies, bees and hummingbirds all at once by planting a summer garden of marigolds, bee balm and milkweed, with some herbs like thyme and mint (although beware of how aggressive mint is... and my thanks to reader Don McNeil for that tip).